Big story: The opener of this Western Conference First Round series will be hard to top from an entertainment standpoint. Alexander Steen’s goal 26 seconds into triple overtime gave the St. Louis Blues a hard-fought victory against the rival Chicago Blackhawks, but the stakes only get higher in Game 2 on Saturday at Scottrade Center (3 p.m. ET). Each team has positives to take into the next meeting. The Blackhawks got highly skilled right wing Patrick Kane (goal) and captain Jonathan Toews (two assists) back from injuries that sidelined them down the final stretch of the regular season. The Blues saw a group of banged-up players return, including captain David Backes (assist on Steen’s goal) and forward Vladimir Tarasenko (goal). Blackhawks: They were 105 seconds away from a 3-2 victory in Game 1, but Jaden Schwartz sent it to overtime with a huge goal after forcing a turnover in the Chicago zone. The Blackhawks, who didn’t practice Friday, can still swipe home-ice advantage before the series shifts to United Center. The goal by Schwartz was in line with a trend from the regular season. Chicago coughed up third-period leads in seven of its 22 games that went past regulation, including four two-goal margins. One of those two-goal leads was blown against the Blues in a 6-5 shootout loss Dec. 28 in St. Louis. Blues: Goaltender Ryan Miller came into Game 1 after allowing 33 goals in his final 11 regular-season appearances. He promptly gave up three more to the Blackhawks in the first period, but didn’t allow another goal. Aided by a strong defensive effort in front of him, Miller made 35 more saves and held the Blues in the game until they found a way to win. Forward Maxim Lapierre did bail him out in the first overtime by blocking a wrist shot by Kris Versteeg that would’ve ended it, but Miller regained his top form after going 0-5-0 with a 3.82 goals-against average in his final five starts of the regular season. Miller worked for about 15 minutes in the practice and only a few others who played in Game 1 skated. Who’s hot: Blackhawks defenseman Brent Seabrook finished with a goal and assist, and Crawford made 48 saves. 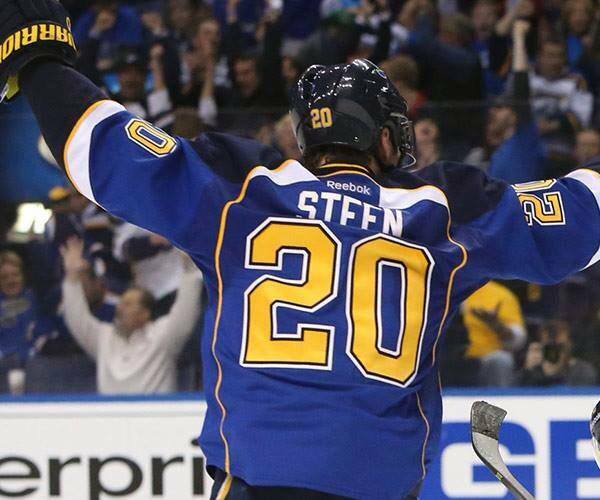 … Blues forwards Steen and Schwartz continued their hot hands against Chicago, scoring goals after each scoring twice in the season series. Injury report: Chicago is fully stocked heading into the postseason. … Oshie (upper body) and Berglund (upper body) were the only St. Louis regulars who didn’t play in Game 1. Each is expected to return at some point in the series.